Damp Prevents combatants from self destructing. Neither this Pokemon nor the enemy can use Explosion or Selfdestruct. Water Absorb Restores HP if hit by a Water-type move. Damage from Water moves instead heals up to 1/4 of this Pokemon's max HP. Unaware* Ignores any change in ability by the foe. This Pokemon ignores any of the enemy's stat changes. Speed calculations are unaffected. Gold This carefree POK�MON has an easy-going nature. While swimming, it always bumps into boat hulls. bumps its head on boulders and boat hulls as it swims. the river bottom as it swims but seems not to care. 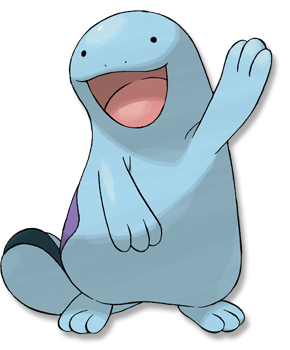 Ruby/Sapphire QUAGSIRE hunts for food by leaving its mouth wide open in water and waiting for its prey to blunder in unaware. Because the POK�MON does not move, it does not get very hungry. Emerald A QUAGSIRE hunts by leaving its mouth wide open in water and waiting for its prey to blunder in. Because it doesn�t move, it does not get very hungry. FireRed Due to its relaxed and carefree attitude, it often bumps its head on boulders and boat hulls as it swims. Leaf Green This carefree POK�MON has an easygoing nature. While swimming, it always bumps into boat hulls. Diamond/Pearl A dim-witted Pok�mon. It doesn�t care if it bumps its head into boats or rocks while swimming. Platinum It has an easygoing nature. It doesn�t care if it bumps its head on boats and boulders while swimming. Heart Gold This carefree Pok�mon has an easy-going nature. While swimming, it always bumps into boat hulls. Soul Silver Due to its relaxed and carefree attitude, it often bumps its head on boulders and boat hulls as it swims. Black It has an easygoing nature. It doesn't care if it bumps its head on boats and boulders while swimming. White It has an easygoing nature. It doesn't care if it bumps its head on boats and boulders while swimming.